Ferrous Moon • Using different skins? editing data.dat? Using different skins? editing data.dat? Post subject: Using different skins? editing data.dat? Is it possible to use different skins in Onlink? I've been trying to use this windows skin http://modlink.net/files/mods/skins/MS_Windows.zip but I haven't been able to get it to work. Dropping it into Onlink's folder with all of its data doesn't work. I tried creating a new data.dat archive using winrar with the new skins (and leaving everything else untouched) but the game glitched out that way; the buttons were missing and I couldn't click anywhere. Am I missing something here or is replacing the default skins with custom ones impossible? As an aside, I also tried adding new corporation names into the corporations list through the winrar method I explained above, but the game does not use them. The game doesn't crash or anything, it just doesn't recognize them. I guess my overall question is: is it possible to edit/customize the data.dat file? Post subject: Re: Using different skins? editing data.dat? 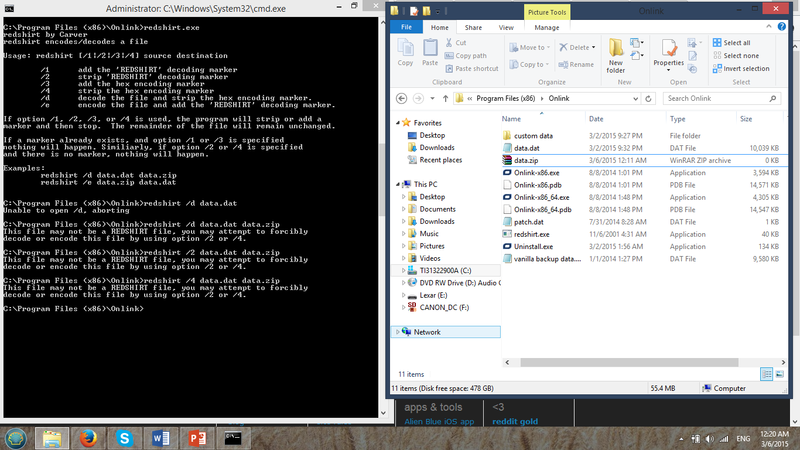 I'm also trying to figure out how to create a new data.dat file. If you can extract the contents with a file compressor, why can you not re-create the .dat file also with a file compressor? Every site with data about drag & drop, ensure correct directory structure, blah blah, I've tried it all but it's not working. All I want to do is add some of the cool gateways from modlink. Please assist. I do not know if they have managed to customize skin and gateway need can use what I've done to me. the themes can to be ajusted. But is missing one button. You still need to update the themes to include Onlink-exclusive assets though. Figured I would reply to this post. You can remove the data.bat file and extract its contents and use it like uplink. The thing is where do you place the extracted files at? unlike uplink the onlink data file should be extracted to the same folder as the saved game files are in. Then what you do is edit or recreate the theme file as it is in the data file. Plus the images and what not. This same thing can be said about gateways as well. however a custom gateway format unlike uplink is changed. As for custom lans go I have not yet figured out how to properly create a working custom lan that does not become useless. If one of you do please let me know how.